Can I have cavity wall insulation? About a third of all the heat lost in an uninsulated home escapes through the walls. Heat will always flow from a warm area to a cold one. In winter, the colder it is outside, the faster heat from your home will escape into the surrounding air. In general, houses built from the 1990s onwards have wall insulation to keep the heat in, but if your house is older than that it may not have any wall insulation. If this is the case then you may be heating the outside air, instead of just heating your home. Most types of wall can be insulated in one way or another. If you have a typical house with cavity walls, you could save up to £155 per year in heating bills just from insulating the walls. The first thing you need to find out is what sort of walls you have. A cavity wall is made up of two walls with a gap in between, known as the cavity; the outer leaf is usually made of brick, and the inner layer of brick or concrete block. A solid wall has no cavity; each wall is a single solid wall, usually made of brick or stone. If your house was built after the 1920s, it is likely to have cavity walls. Older houses are more likely to have solid walls. If the brickwork has been covered, you can also tell by measuring the width of the wall. Examine a window or door on one of your external walls. If a brick wall is more than 260mm thick then it probably has a cavity; a narrower wall is probably solid. Stone walls may be thicker still but are usually solid. If your house is a steel-frame or timber-framed building, or is made from pre-fabricated concrete different rules apply for insulation. Generally these houses don't have a cavity to fill, but it may be possible to insulate them in the same way as a solid wall. However, you may need a specialist company to insulate a non-standard wall. For further advice or to find an installer who can help you, contact the National Insulation Association. Cavity wall insulation fills gaps often found between external walls in homes built after 1920, keeping the warmth in to save energy. It can also help reduce condensation inside the house if this is a problem stemming from your external walls. These are estimated figures based on insulating a gas-heated home. The average installed cost is unsubsidised. Figures are based on fuel prices as of March 2016. These are estimated figures based on insulating an oil-heated home. The average installed cost is unsubsidised. Figures are based on fuel rpcies as of March 2016. 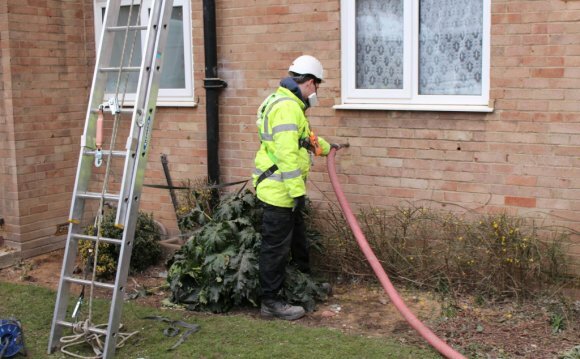 Is cavity wall insulation suitable for your home? Its external walls are unfilled cavity walls. Your cavity is at least 50mm wide. The masonry or brickwork of your property is in good condition. It is more than 10 years old (most newer houses will have insulation already). The walls are not exposed to driving rain. What Causes water stains on ceiling?